Sheldon Krimsky is the Carol Zicklin Visiting Professor of Philosophy at Brooklyn College, the Lenore Stern Professor of Humanities and Social Sciences at Tufts University, and adjunct professor in the Department of Public Health and Community Medicine at the School of Medicine at Tufts University. The author resides in New York City and Cambridge, Massachusetts. This book is an anthology of previously published articles by the author Sheldon Krimsky, frequently as the sole author. Many stories are out of date, dating back to 1984. These articles are written in scholarly tone and many reflect sociological studies done by Krimsky. There is a lot of overlap between the articles and I found myself just flipping pages until the conclusions of the articles which were usually interesting and well written. 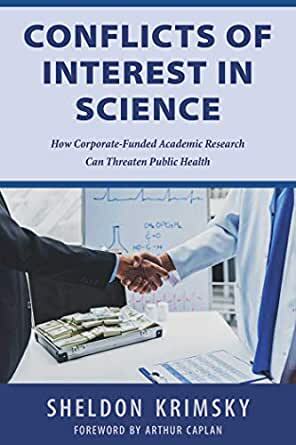 Also interesting were Krimsky’s ideas of how to fight financial conflicts of interest, but most of the articles were about conflicts of interest involving the pharmaceutical industry, so this wasn’t a good look at conflicts in science overall. The anthology was just interesting enough to keep going, as I was tempted several times to stop reading because of the huge overlap between articles. Ironically, although Krimsky rails against bias, I think that using only articles authored by Krimsky himself introduces a huge bias. I read Corrupted Science by John Grant and found this book by far more enjoyable than Krimsky’s. Disclosure: I received a complimentary copy of this book via Netgalley for review purposes.